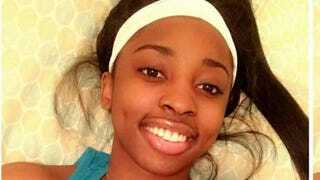 The investigation into the mysterious death of Chicago teen Kenneka Jenkins has been closed by authorities in Rosemont, Ill., who have determined that her death was accidental and who said Friday that there is “no evidence that indicates any other conclusion.” But photos of Jenkins’ body were released Friday evening, raising more questions about the decision to close the investigation. Rosemont officials released photographs, videos, audio recordings and other documents related to the Jenkins investigation on the Rosemont Village website. Included in that release are photos of Jenkins’ body still in the hotel walk-in freezer where she was found. The photos are graphic and hard to look at. There are bruises on her body. She is missing a shoe from one foot, and that foot is bruised and bloody. The freezer itself is filthy and full of litter. The pictures make the situation more confusing. Jenkins, 19, went missing after attending a party at the Crowne Plaza Hotel in Rosemont. She was found dead 21 hours later, on Sept. 10, in a walk-in freezer at the same hotel. Rosemont police said in their report that Jenkins was found on her side, facedown. Her left arm was underneath her, her right shoe was off and she had a small cut on her right foot. All of that can be seen in the released photos. Our detective reported no signs of foul play throughout the whole investigation. There is no evidence that Ms. Jenkins was forced to drink alcohol or consume any narcotics while at the hotel. While there were many theories, rumors and much speculation floating around social media regarding the death of Ms. Jenkins, none were supported with facts. While all leads and theories were investigated by our department, what we have reported throughout the investigation and again, today, are facts. Even with that, looking at these photos does nothing to ease the mind. They cause more alarm. Read more at rosemont.com and the Chicago Tribune.